Steve Cauthen (born May 1, 1960) is an American jockey who is now retired. Cauthen, the son of a trainer and a farrier, grew up in Walton, Kentucky around horses, which (along with his small size) made race-riding a logical career choice. He rode his first race on May 12, 1976 at Churchill Downs; he finished last, riding King of Swat. He rode his first winner (Red Pipe) less than a week later, at River Downs. In 1978 he became the youngest jockey to ever win the U. S. Triple Crown, riding Affirmed, and he was named Sports Illustrated Sportsman of the Year. For 37 years he held the distinction of being the last jockey to sweep all legs of the Triple Crown until Victor Espinoza won the Triple Crown with American Pharoah in 2015. He had increasing problems making the weight and moved to the UK, where jockey weights were higher. In his first race in the UK in April 1979 he rode Marquee Universal to victory at Salisbury. Cauthen was British Champion Jockey three times, and won English classic races ten times, including the 2,000 Guineas, the Epsom Derby twice, and the St. Leger Stakes three times. In 1985 he captured the British Fillies' Triple Crown aboard Oh So Sharp. He also won the Irish Oaks twice and in 1989 rode European Horse of the Year, Old Vic to victory in the French Derby and the Irish Derby. In 1991 he won the Derby Italiano on Hailsham. After he finished his riding career, he returned to Kentucky, where he became an executive at Turfway Park, the nearest major track to his hometown. In 1984, Cauthen received the prestigious National Museum of Racing and Hall of Fame in 1994. He is married to Amy and they have three daughters. ^ a b "Steven Cauthen". National Museum of Racing. Retrieved 6 June 2015. .
^ "Steve Cauthen". Derby Legends. Retrieved 7 July 2014. 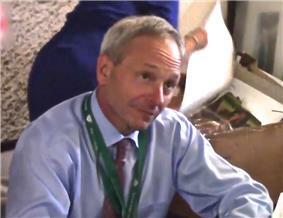 ^ "Steve Cauthen: career profile". Racing Post. Century com. Retrieved 7 July 2014. ^ Richard Edmondson (6 November 1998). "Racing: Cauthen finds bluegrass is greener". The Independent. Retrieved 8 November 2014.